Earlier this week, the San Francisco chronicle posted an article that claimed that it’s hard to find fresh, affordable food in Mendocino County. It was a ridiculous article, written by someone who ignored all of the local farmers markets which are filled with … um….. fresh, affordable food. The girls at Eat Mendocino have already written an excellent response to the article, explaining why the Chronicle was completely wrong, so I won’t rehash what they’ve already written. 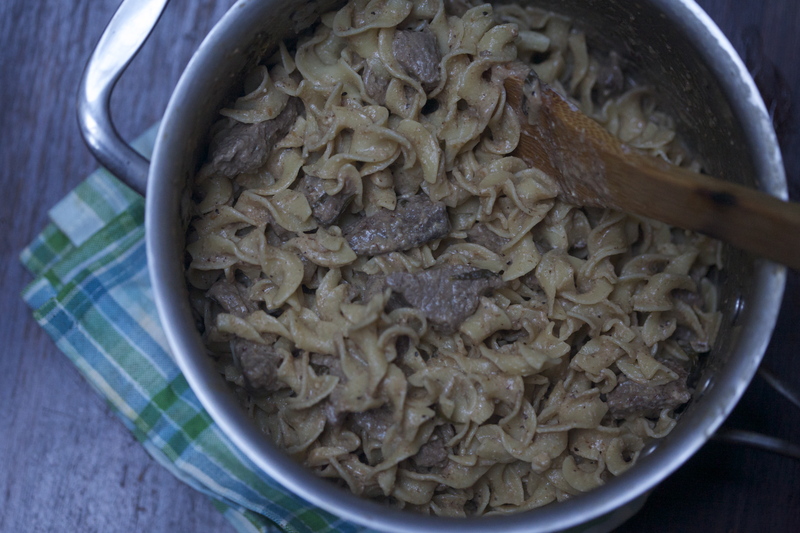 Their whole conversation made me want to share this beef stroganoff recipe with you. This whole blog is about cooking with fresh, local, affordable foods, but a lot of the time I make the recipes affordable by making them vegetarian, since a lot of locally sourced meats can be prohibitively expensive. I love eating all this hippie crunchy food, but sometimes it’s nice to have something a little bit more… meat and potatoes. Maybe you’re cooking for picky eaters, maybe it’s cold out an you want some comfort food, maybe you’ve been slaving away all day in the garden and you’re craving something with protein and carbs. 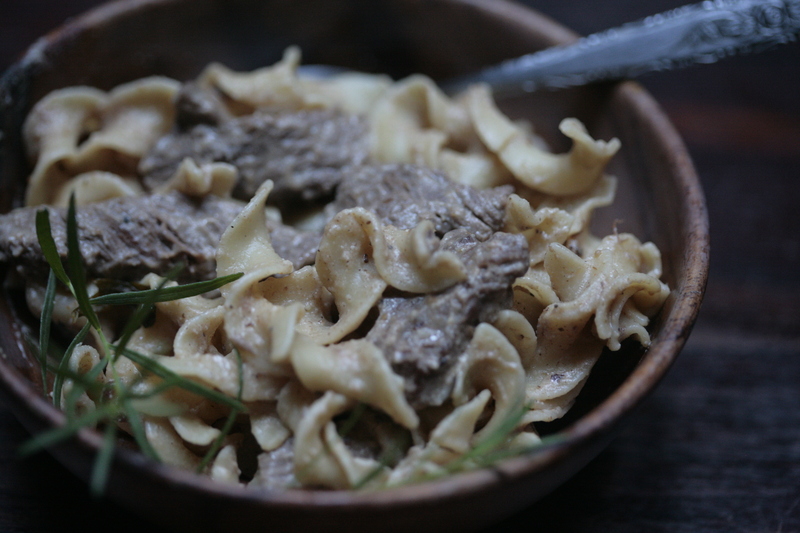 Whatever the occasion, this beef stroganoff is delicious. Since this recipe makes a flavorful sauce to serve over mashed potatoes or noodles, you really only need a pound of meat to make a big pot of food. Also, it cooks up in a flash. Also it’s cheap. It’s easily adaptable to different ingredients. The leftovers (if there are any) make a great lunch the next day. Oh, and I realized after I started writing about this…. it’s basically just a homemade version of hamburger helper in the stroganoff flavor. Because we like eating classy stuff like that. There are several ways you can adapt this recipe. First, the meat: the cut doesn’t really matter. You can use ground beef, which is almost always one of the cheapest meats at the farmers market. If you use a steak that’s more on the tender side (sirloin, ribeye, strip) keep the cooking time to 30 minutes. If you want to use stew meat, an add extra cup of stock to the recipe and cook it for an extra hour or more. You can substitute mushrooms for the beef if you want something vegetarian. You can add all kinds of vegetables while you’re browning the beef: shallots, leeks, onions, some chopped swiss chard, peas, mushrooms. Whatever looks good at the farmers market that week will be great. optional add-ins: sliced mushrooms, sliced shallots, peas, chopped spinach, etc. Heat the butter in a large skillet. Add the steak and garlic and cook for a few minutes on medium-high heat to brown the steak. (If you want to add extra vegetables, now’s the time). Season everything with salt and pepper. Once the steak is browned, add the whole wheat flour and saute everything for another minute or two. Deglaze the pan with a splash of cognac, if you have it. (If you don’t, it will taste good without it. Just deglaze the pan with the stock instead). Add the beef stock, sour cream, paprika and tarragon and stir everything together. Turn the heat down to a simmer and cook for 30 minutes. Serve over buttered egg noodles or mashed potatoes. We like having this dish with a big green salad or sauteed green beans. This is some fancy hamburger helper! LOL! But as a kid, I even liked that, so this is a tasty and much better version of a classic comfort food. 🙂 Yum!